A few weeks before InfoComm, there was a pretty big gathering of industry leadership in Greenville, SC. 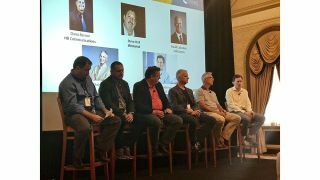 Up there on the dais were presidents and CEOs of big companies and big associations eager to talk to an audience of top-level AV and IT integrators gathered for SYNNEX’s annual Strategic Partner Summit in Greenville, SC on May 17-19. And what these many influencers were talking about was how business objectives are being unified along the same trajectory that technologies have taken these past few years. A convergence of talents will be necessary to capitalize on the next phase of growth. (from left to right) Tommy Plumer, VP of sales for SYNNEX, AV, Dana Barron, CEO of HB Communications and president of PSNI, Steve Hull, VP of sales for Westwind Computer Products, David Labuskes, executive director and CEO of InfoComm, and Chris Miller, executive director of PSNI, Todd Thibodeaux, president and CEO of CompTIA. Truly, the star-studded leadership picture was remarkable. In a discussion moderated by Tommy Plumer, VP of sales for SYNNEX, AV and IT truths were shared by David Labuskes, executive director and CEO of InfoComm, Todd Thibodeaux, president and CEO of CompTIA, Chris Miller, executive director of PSNI, Dana Barron, CEO of HB Communications and president of PSNI, and Steve Hull, VP of sales for Westwind Computer Products. Together, they provided an honest look at how partnerships are playing out between AV and IT integrators—and how both those factions are being served by the manufacturers and distributors who are playing an increasing role in lead generation, design services, and the product upgrade cycle. Now that success stories are less about solving hardware mysteries and more about relieving clients’ pain points, the channel must shift its sales approach and messaging. Sure, we all know that now we sell solutions, not boxes. But it will be vital to start quantifying those solutions with data. And guess who has the data? Vendors and distributors like SYNNEX. They know the market and they are eager to partner with the channel in new ways to connect leads with dealers. So partnership was in the air at the SYNNEX Strategic Partner Summit. The word “coopertition” was bandied about as AV and IT dealers learned how they can work together to expand project scope. And vendor sponsors were there to not only show products, but to talk about how they partner with SYNNEX to partner dealers with leads. This sixth edition of the Strategic Partner Summit provided new evidence of how SYNNEX’s unique offerings are coming to fruition in AV projects that have an increasing amount of IT components. As a distribution company with deep and broad roots in the IT world, SYNNEX sees a big school job and encourages an AV company to go not only for the video projectors and digital signage, but also Wi-Fi boosting and laptops. And if they don’t have the IT know-how in house, Synnex will connect partners to get the job done. With that expansion into devices comes a natural evolution into a subscription model of business. Just as on the consumer side, fewer people own mobile devices outright, they just pay monthly fees for the hardware; now on the commercial side it’s becoming possible to offer that type of rolling product support. SYNNEX can help set up those types of solutions for dealers, and even provide financing to support that type of business move or other leaps into larger project scopes. Those financing programs are an element of the SYNNEX partnership that more integrators are utilizing, along with the distributor’s services team, which provides support for personnel needs, and design and deployment assistance where needed. Basically it’s a readymade partner who is not a competitor. When you open up the IT side of project scope, suddenly there is a lot more to sell. For instance in education, campus-wide Wi-Fi refreshes are a constant with the steadily increasing number of wireless devices per student. Then there’s storage, surveillance, and even wired networks, which require updates to increase security and bandwidth. And there it is, the capstone on the soaring arch of partnerships and outcomes: trusted advisor. Become the trusted advisor to your clients, while enjoying the trusted advice of vendor partners, distributors, and your IT integration coopertition, and the AV outcomes are going to be bullish indeed.